In 2005 my wife dragged me, kicking and screaming, to China. I did not want to go because I had a picture in my head that I was quite comfortable with and didn’t feel like challenging it. But, since my wife is almost invariably right it turned out to be one of the most amazing trips of my life. I still talk about the asparagus. Best asparagus ever. No doubt it was farmed in melamine-tainted soil with carcinogenic fertilizers – but it was truly delicious. My experiences in China taught me many things – and I wrote about it here. The trip opened my eyes to the fact that China is not communist as much as it’s totalitarian capitalist. I saw Ferarris and BMWs and other expensive cars you’re not supposed to have in Marx’s ludicrous class-free fantasy land. I saw a modernity that I’d never expected to see. Sure, over a billion live in squalor, but 300 million more – a number that’s close to the total number of us here in the U.S. – live middle and upper-middle class lives. They go to bars and restaurants, hang out with friends, drive cars, and have jobs that don’t involve wearing comrade overalls. In many ways they’re like us, with the exception that the government is ominous, ever-present and really creepy. One of the most popular things I’ve ever written came from the trip. Sad really. I spend so much time trying to be high-brow, yet I write about poo and it becomes the star of the show. China introduced me to fantastic and bizarre culinary and cultural experiences. Like sucking down dumplings as twelve people stood around me, waiting to take my seat. And eating a bird’s nest. But one of the most enriching experiences came from talking to people. They live on the other side of the world, have a totally different perspective on life, and have ingrained opinions on our culture and lifestyle – just as we do about theirs. Naturally, they’re guarded. Their lives can be dramatically altered at the whim of the state. For that reason, most of the people I met steered clear of politics. Some people were clearly brainwashed – like the ones peddling Mao’s Little Red Book and selling cutesy Mao watches. The man killed millions upon millions of his own people – on purpose and through failed policy – yet to lots of folks he’s like Bono. Other people simply chose the path of least resistance. They had good lives, especially when compared to the life of a peasant in the countryside. They didn’t want to muck that up. You don’t ask questions, you accept the rules that are laid down, you sacrifice what you’re asked to sacrifice, and all’s well. But there are others. The ones who see through the propaganda, the censorship and the whitewashing. They’re not content to live in a land of awesome asparagus. They see their government for what it is: a big, uncaring, scary, all-powerful machine that is perfectly willing to gun down thousands of people for the crime of wanting something better. I met one of those people on the trip. In the safety and security of his car he was able to let his guard down and as we talked I got a sense that he was a dissenter. Unlike other people who had recited the party line to me on various topics, he had opinions and asked me questions about my country and politics. As we went past the giant portrait of Mao over the gates of Tiananmen I asked him what he thought about Mao, Tiananmen, the Party and the night in 1989 when students did the unthinkable by gathering in protest. Something that scared the living bejeezus out of their government. He shook his head, and recalled that night. He was there. Hope and change weren’t marketing buzzwords, they were ripples emanating from that square and rocking the very foundation of the Chinese government. He was there when that excitement turned into terror as gunfire ripped people apart, and he was among the panicked crowds that fled down side streets, lucky to avoid the bullets and batons his government used to silence dissent. He lost friends that night. And he was full of anger about it, as he should have been. I took away from our conversation two things: One, he was a man who, just like you and I would, seethed from the injustice perpetrated on his fellow citizens. And two, he was afraid that his government would succeed in making it all a distant memory. 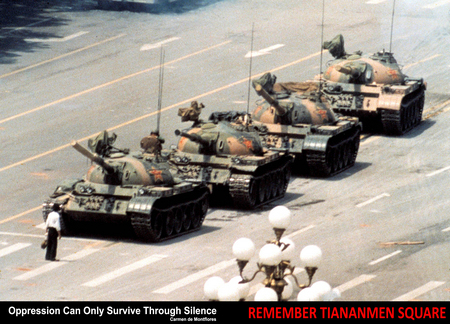 The leaders of the People’s Republic would really, really like us all to forget that night, twenty years ago today. They do every Orwellian thing they can to pretend it was a non-event, that thousands didn’t die, and that parents weren’t awakened by soldiers dumping the bodies of their children on the doorstep. It was an ugly, ugly night. They’d like to forget it all happened. All you have to do to strike a blow against tyranny is to not let them. My friend would thank you. Quietly, of course.